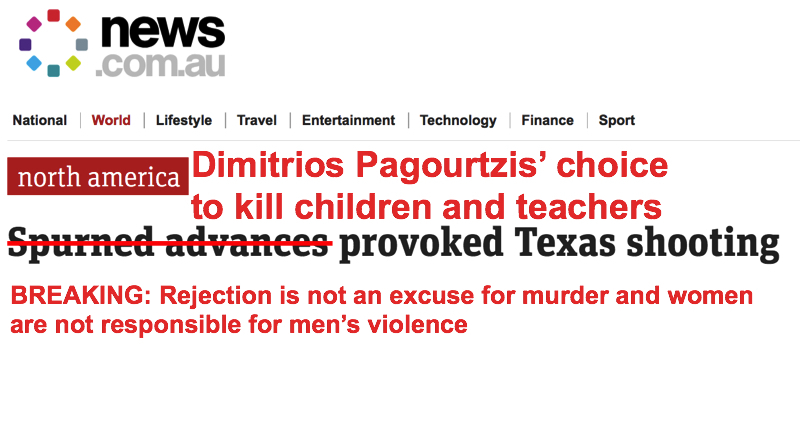 News.com.au is only one of many outlets reporting today that the blame for Dimitrios Pagourtzis choice to take guns to a school and kill people rest on one of his victims. 16 year old Shana Fisher, one of the ten people Pagourtzis shot and killed last Friday, had apparently “spurned” his advances. Police are still investigating the details and it’s far too early to be speculating on motive and circumstance, but whatever comes out in the trial and investigation of the latest mass shooting in American schools. there are no circumstances in which a murdered girl can be blamed for the violence Pagourtzis chose to commit against her, her classmates and her teachers. Violence is always a choice and victims are not the ones who make that choice.